Road Trail Run: New Balance Fresh Foam Zante Solas Review: Super Light Fresh Foam Fun! New Balance Fresh Foam Zante Solas Review: Super Light Fresh Foam Fun! Someone at New Balance is listening, or I dreamed the Zante Solas into life. Despite being a long-time fan of the Zante line, I wasn’t sold on the Pursuit. Specifically, I commented in my review that I’d like to see NB produce the model with a Fresh Foam Ground Contact outsole. Enter the Zante Solas, which has the precise outsole I wished for. Thank you, New Balance! This model shares the heritage of the Zante, but takes the line in an even more stripped-down direction than the Pursuit. I won’t say minimalist because that means a certain thing in the running world, but in a design sense, the shoe is very simple. 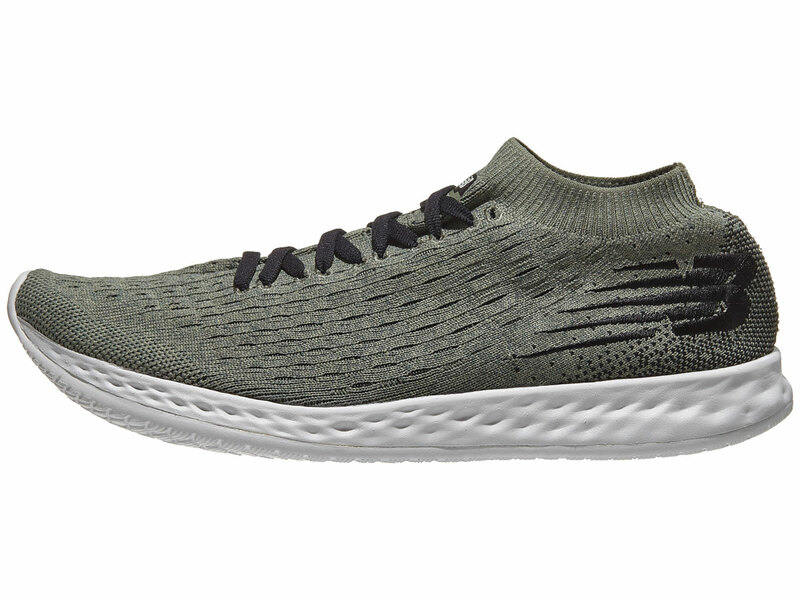 There’s a sock-like upper atop a Fresh Foam midsole and a Fresh Foam Ground Contact outsole. The Zante line has a history of snazzy shoes and the Solas is no exception. In a classy charcoal gray colorway (officially Black/Castlerock, which gives me good vibes about a certain cable show returning soon for its final season), the Solas is easy on the eyes. 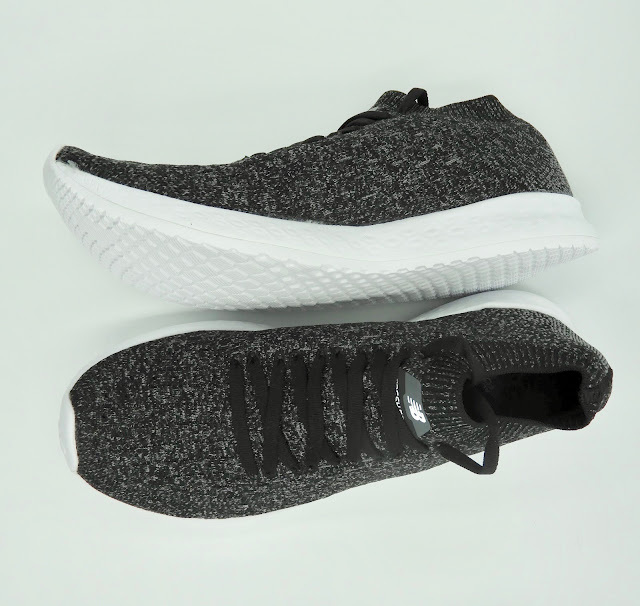 The upper includes a high collar somewhat reminiscent of the Nike Lunar Epic, but not quite so high -- think ankle sock instead of a low crew sock. My guess is that this extended collar enables the comfortably snug fit of the Solas as it allows for yet another point of contact between the upper and the wearer. The model feels true to size in my women’s 9.5. I like to have about a thumb’s width of room between my big toe and the end of the shoe and I have that in the Solas. The Hypoknit upper works like a dream for my foot. 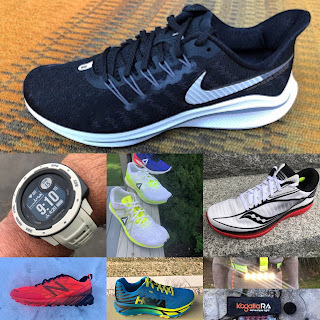 I’m often suspicious of sock-like uppers because I generally prefer a locked down feel (almost like what you get in a racer) because I have had ankle problems in the past. Basically, I want to know that if I’m putting my foot down on an uneven surface my shoe will be exactly where I expect it to be. The Solas upper is reassuringly secure, but somewhat relaxed. What I mean by that is that I put the shoe on and feel like it’s fitted correctly even before tying the laces. Here laces help the shoe feel even more locked down, but they don’t interact with the upper in a way that allows it to be loosened or tightened like conventional shoes. The laces can fix a situation where the upper is too loose, but can’t remedy a situation where it’s too tight. Happily, the Solas fits me well and disappears on my foot during the run. When huffing and puffing my way through speedwork, the last thing I want to be thinking about is my shoes, so the Solas has been a great partner for 400m-1200m repeats and beyond because it’s so comfortable. Fresh Foam isn’t new, but it’s still so good. New Balance keeps tweaking their signature midsole compound every year. The 2018-2019 formula is my favorite yet. The midsole on the Solas is responsive, but not harsh like New Balance’s other famous foam REVlite can be. It’s no marshmallow either, but it has the right amount of give to it. I’d describe it as snappy at all paces, so this is probably not an ideal recovery day shoe, but there’s enough protection for longer efforts and still enough giddyup to help you crush a track workout. Fresh Foam Ground Contact is the star of the show here for me (insofar as there is a star at all in a shoe that disappears on my foot). I really like how a single slab of Fresh Foam midsole works with a full-coverage outsole, as seen in the Zante v1-v4 which all have durable single-piece rubber outsoles. But too much rubber can make for a heavy shoe with an overly firm ride. With the Fresh Foam Ground Contact compound, you get the smooth feel of a one-piece outsole with the flexibility and light weight that comes with not having rubber. Grip is adequate and I haven’t noticed any major issues with durability. Foam is going to break down faster than rubber in this application, so moderate your expectations accordingly. The Solas is smooth and snappy. Between the ultralight weight and the responsive midsole, I feel like the Solas encourages faster turnover. However unlike a lot of go-fast shoes, it’s just as friendly at easy paces as it is at speed. This isn’t a shoe that feels bad until you stomp on the gas. I’m not a speed demon (my faster stuff is warm-up pace for a lot of runners) so if I can enjoy an uptempo trainer without having to put on the afterburners every time, that’s a pretty good indication that it’s an “every pace” shoe. I really like the Solas. I’m not sure I’d race a 5k in it (the comfortable, somewhat relaxed upper is not quite race-tuned for the all-out chaos of me running as fast as I can for a full 5k), but it’s certainly light and zippy enough. 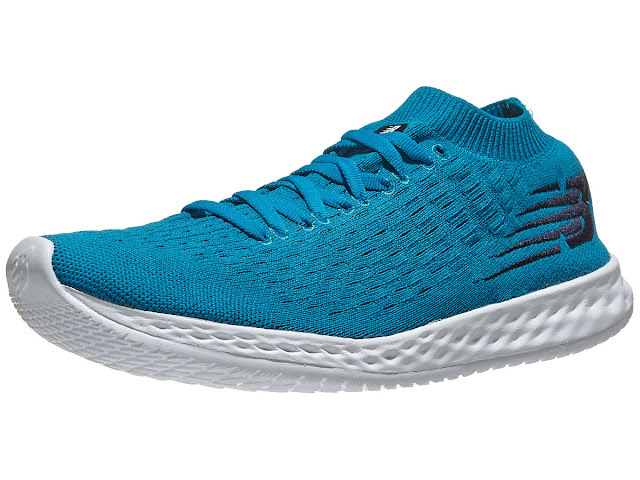 Likewise, it’s probably not enough shoe for me past the half marathon distance because the upper does not provide much support and the shoe itself is so incredibly light. But I could see racing 10-13.1 miles in it. As an uptempo trainer, it’s a lot of fun and I think that’s it’s true calling. Others have said it before on this site and I’ll say it again: the highest compliment for a shoe is to say that you don’t notice it during a run. I don’t notice the Solas. I think a fairly wide variety of runners who are comfortable in neutral shoes could enjoy this model. Larger runners and those with especially high- or low-volume feet may want to try these on a treadmill at a specialty running store. 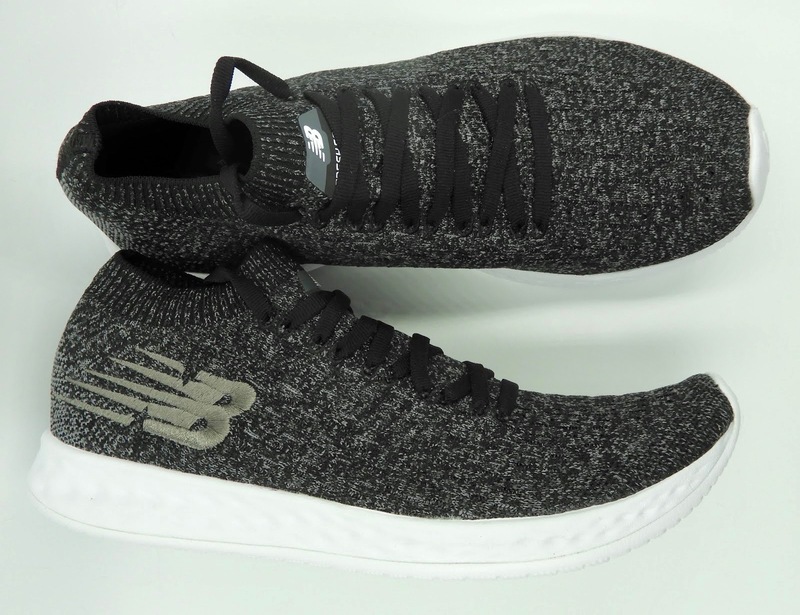 While the sock-like upper works well for me, the limited ability to customize the fit of the shoe (laces can only do so much on this kind of upper) and the soft materials (overlay-free fabric can only be so supportive) may be problem areas. Aside from those concerns, this is a fun, fast, ultralight shoe that I highly recommend. I also want to commend New Balance for making another excellent performer available for under $100. Budget friendly and comfortable at a range of paces? Count me in. I’d love to see this become a trend. The Solas is a lot lighter, softer, and more flexible than the Pursuit thanks to its use of a foam (instead of rubber) outsole. The Fresh Foam in the Solas seems a touch softer and thinner, so it’s impressive that NB got a softer feel with less material. This makes it more forgiving and more fun. I’d pick the Solas every time. The Beacon is more of a long-haul shoe (and as such it has more cushioning). 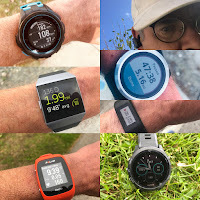 Although I think the Solas has more range (track workouts, uptempo runs, middle-distance racing), I prefer the traditional fit of the Beacon’s upper, so it’s my pick. The Hyperion is comparable to the Solas in terms of weight. I haven’t tried many models in this featherweight class! The Hyperion is a dedicated racer with a simple jacquard upper. Like the Solas, it’s also fun at easy paces. If you’re after an ultralight shoe for use as a trainer, I’d pick the Solas, but otherwise I lean towards the Hyperion. Solas feels softer, but both have a great groundfeel. New Balance is on fire lately. This and the Hanzo S V2 are very exciting release this year.